The Difference Engine is a hard book to review. On one hand it is technothriller that asks, “What if Charles Babbage had succeeded in building his programmable computer in the 19th century?” On another it is literary science fiction, with a depth comparable to Arthur C. Clarke’s 2001 or Isaac Asimov’s Foundation. On the third it’s a rumination on word processing. Charles Babbage and Charles Darwin were contemporaries in early 19th century Britain. Both men made great discoveries, and both were perfectionists. Famously, Darwin only published his theories when he heard that Wallace had independently discovered natural selection and was going to release his own version of the theory. Less famously, Babbage designed the Difference Engine (which has successfully been constructed from his plans in our down day), a mechanical computer, but abandoned work finishing it to attempt the Analytical Engine, a computer that was as advanced as the electronic ENIAC that was finally built more than a century later. No men, if their careers could have been more successful, might have changed our world more than Archimedes and Charles Babbage. But what would such a world have looked like? Could an information revolution occur at the same time as an industrial revolution? Who would benefit from such a world? Who would oppose it? The Difference Engine is composed of several “Iterations” and a final “Modus.” Many characters appear again and again, though often the reader’s view of them differ – a character might simply be standing near an event in one iteration, an antagonist in a second, a helper in a third, and the protagonist in the fourth. 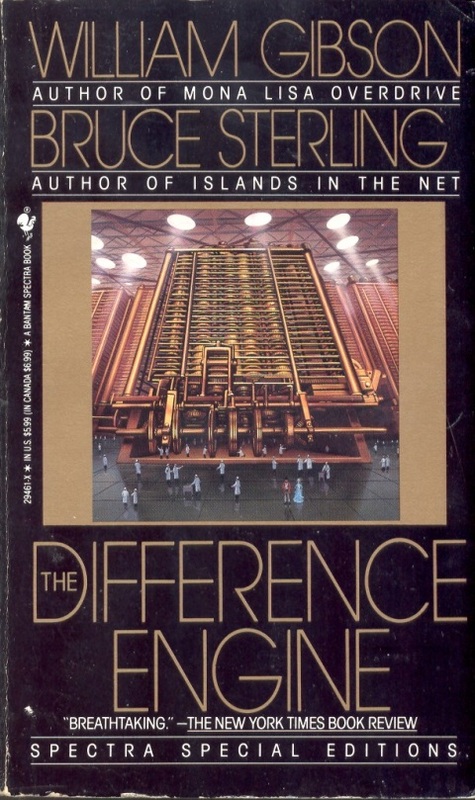 The meaning of the ending of The Difference Engine is disputed, and (in the finest literary tradition) there is no need to take the authors’ remarks as the last word. I’m still unsure what finally happens. I read The Difference Engine on my Kindle. The most important difference in the world of The Difference Engine is that by 2012 spell check will have advanced to semiotics check! I am waiting for good quality fast and cheap voice dictation to text. My finger and eye coordination are optimal for keyboards. Wodan help me when I am forced to use smart phones. I just had a my own Steam Punk idea. What if Edison (with Tesla) had picked up the difference machine and analytical engine work? He had the brains to make it work and the ability to market/commercialize it. Ugg…now I am just thinking about WW1 with even create carnage. The ironic thing, of course, is that Edison and Tesla are so /recent/… If you account for its grossly inefficient design, the German Z3 was the first computer able to function on the same level (Turing Complete) as the Analytical Engine, in 1941. If Tesla had built an electric Analytical Engine at, say, age 30, tht would put its release in the 1880s, /only/ sixty years ahead of the Z3. The scale of Babbage’s near-achievement is staggering.